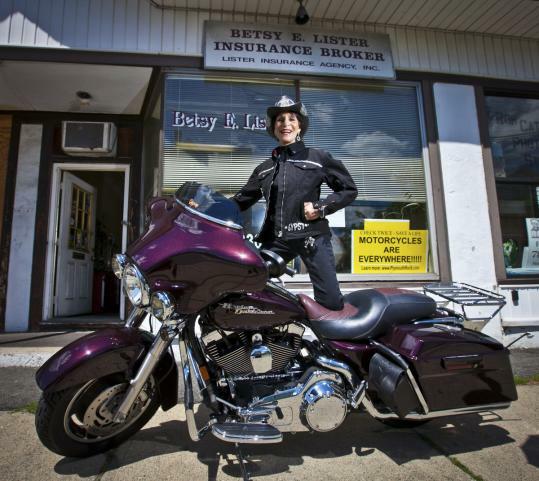 MEDFORD — Lots of people have “bucket lists.’’ Then there’s Betsy Lister of Medford, the godmother of Massachusetts biker babes. She already has a bucketful of items she’s successfully crossed off her list. Her achievements are enough that she’s earned a place on motorcycling’s equivalent of Mt. Rushmore — being inducted into the Motorcycle Hall of Fame in Sturgis, S.D., last summer. There, she joined the likes of Malcolm Forbes, Jay Leno, Peter Fonda, and lots of folks with Harley and Davidson surnames. You can almost hear Sinatra singing “That’s Life’’ (“I’ve been a puppet, a pauper, a pirate, a poet, a pawn, and a king’’) in the background when friends tick off her accomplishments: successful businesswoman who runs her own insurance agency, motorcyclist, veterans advocate, poet, event organizer, Web newsletter author/editor, mother, dog lover, Harley-Davidson rider. And skydiver. “To celebrate my 60th birthday,’’ she says. If you’re one of the Commonwealth’s 186,000-plus licensed motorcycle riders, you can thank Lister for years of activism that have led to lower insurance rates, increased safety awareness, and greater attention to motorcycling by the Registry of Motor Vehicles and attorney general’s office. Her interest in aiding veterans began with her marriage to a Vietnam veteran in 1967. Motorcycling entered the picture in 1969. “My hubby took a spill on the bike we co-owned and wouldn’t get back on. After that, he took the car to work, and I took the bike. You’ve got to visualize here and see me — in a miniskirt — on the bike riding up Route 128 every day,’’ she said. So now Lister, at 63, rides a Harley Street Glide with 16,000 miles on the odometer, just some of the 130,000 miles she’s ridden over the years. If someone wants to ride with her, they’ll have to check with Bumpkin, her teacup Maltese, who often comes along in a special riding pouch. Besides running the Medford insurance agency that bears her name, Lister updates her weekday motorcyclists’ newsletter — bikerbits.info. On weekends, she switches gears and updates her veterans’ newsletter that’s linked from another motorcycling website she maintains called "Gypsypashn.com," which is her road name. This summer she’ll be riding the roads of New England and writing more poetry by Gypsy Pashn. August is Biker Poetry Month and this three-time “biker poet laureate’’ of New Hampshire and Massachusetts will do a reading Aug. 15 at Out of the Blue Gallery in Cambridge. ■Amy “Diva’’ Skaling of Park City, Utah. She rides a leopard-painted, Swarovski-studded “Diva Glide’’ and designs embellished apparel and accessories. ■ Vicki “Spitfire’’ Sanfelipo of Milwaukee. She’s the founder of the group and executive director of Accident Scene Management Inc., which gives courses in responding to motorcycle accidents. This year, the women have invited Lister to join them as their “celebrity rider’’ as they each lead a group of riders from their home cities to visit VA hospitals en route to convening at Gail’s Harley-Davidson in Kansas City, Mo., for a veterans rally on Sept. 10 and 11. The women’s goal is to raise $20,000 to provide a veteran with an assistance dog from NEADS, Dogs for Deaf and Disabled Americans. Each rider will have their own “posse’’ joining them for the ride. Lister’s consists of at least a dozen confirmed riders, and will pick up several more on route to Kansas City. If last year’s ride is any indication, an unofficial national “biker network’’ will have local clubs turning out to join in sections of the ride and for VA visits. When she gets home, Lister will be putting the finishing touches on the 4th annual J.J. Harris Ride, scheduled for Oct. 2 at the American Legion Post on River Street in Middleton. Marine Captain Jennifer Harris of Swampscott was 28 when the helicopter she was flying in was shot down in Anbar Province, Iraq, on Feb. 7, 2007. The ride is scheduled to cover a 50-mile loop, finishing with a barbecue at the post. If there’s one thing Lister knows how to do, it’s get her message across. “The key is getting the right person to listen to you,’’ she says. Let that be fair warning to the folks at the National Football League. NBC is carrying the Super Bowl next winter — assuming there’s an NFL season—and Lister has a vision she’d like to make reality. Bill Griffith can be reached at WGriffith@globe.com.